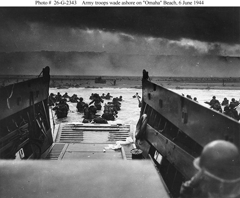 One of the first waves of the assault on Omaha Beach on D-Day, June 6, 1944. The Coast Guard caption identifies the unit as Company E, 16th Infantry, 1st Infantry Division. The decision to attack on June 6 was extremely complex. The weather was predicted to be less than ideal, with significant risk of weather-related difficulty. However, if the landings had been postponed for better weather, the need for favorable low tides at dawn would have required a delay of 13 days. Moreover, in the intervening time, maintaining secrecy would have been difficult. Thus both options had serious risks. The risks for June 6 were so serious that Gen. Eisenhower composed a statement to be used in the event of failure of the assault. A measure of Eisenhower's management of his own reactance was his willingness to proceed on June 6, knowing the risks. Photo from the archives of the U.S. Coast Guard, courtesy U.S. Navy Naval History and Heritage Command. Because most decisions are easily made, we make many more decisions than we realize. For example, you decided to read this wherever you are now reading it. You can probably reconstruct the reasons for your decision, but you might have to think about it because the decision was so easy. For difficult decisions, we have meetings. We debate back and forth. The debates can be long and heated. Sometimes we make the decision and then realize we need to rethink. Difficult decisions can be messy. Some difficulties arise because the issues are complex, we lack important information, politics is involved, or goodness knows what else. But often, the content of the decision is only part of the problem. Difficulty can also arise from the psychology of deciding. Here are five factors that can make deciding difficult. Psychological reactance is the human response to a loss of behavioral freedom, or to the perception of threats to behavioral freedom. Because choosing one option necessarily implies loss of freedom to choose the other options, making a decision can create reactance. See "Reactance and Micromanagement," Point Lookout for April 11, 2012, for more. To alleviate reactance, we sometimes avoid deciding, or we do what we can to delay. When decisions have time limits — even self-imposed limits — we experience reactance because we perceive threats to our freedoms that increase as the time for decision draws near. The freedoms that are threatened include the freedom to choose any of the less-favored options, and the freedom not to choose at all. As time grows short, things can get tense. we do what we can to delayof reactance is a phenomenon called convergence, in which the most favored options become less attractive, while the less-favored options become more attractive. Typically, the effect on the less-favored options is greater, with the effect on the most-favored of the less-favored being greatest. As we move closer to a decision, the differences between options can blur. As the decision process proceeds, and reactance increases, we sometimes subvert the decision-making process. For example, we might suddenly question preliminary conclusions, such as the early elimination of some options. When this comes about as a consequence of reactance, it's more likely to occur as the field of choices narrows. Reactance can cause us to "unbutton" preliminary decisions that we thought we had agreed to. When there are many attractive options, choosing one threatens the freedom to choose the others, which leads to reactance. The most attractive option tends to become less attractive than the second most attractive option. Inversions like this can occur when there are multiple options. For more about psychological reactance, see Psychological Reactance: A Theory of Freedom and Control by Sharon S. Brehm and Jack W. Brehm. New York: Academic Press, 1981. Available from Amazon. For more articles about reactance, see "Reactance and Micromanagement," Point Lookout for April 11, 2012, and "Cognitive Biases and Influence: II," Point Lookout for July 13, 2016. Would you like to see your comments posted here? rbrenXWBBkqUxSyuTiwWbner@ChachrfXBHYmSmQrcDOToCanyon.comSend me your comments by email, or by Web form. I offer email and telephone coaching at both corporate and individual rates. Contact Rick for details at rbrenXSPpkaPaUlyrJVXxner@ChaceXWLjqBylytVAABboCanyon.com or (650) 787-6475, or toll-free in the continental US at (866) 378-5470.